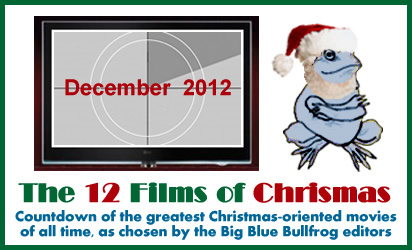 Some of you may be outraged to find this movie here at number twelve on this list. First; my apologies…second have you seen how overplayed this film has become? 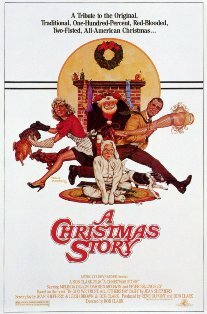 On Christmas Day this becomes the only film about Christmas that you can find on television! It’s the most frustrating day of television…I’d like to see some Rudolph, or the Year without Santa Claus and all I can get is A Christmas Story! Now of course this blame mostly falls to the TBS network and not on the film itself but my god…enough is ENOUGH! It’s pretty weird to look at how this film was received when it was released and how it is currently perceived. Did shameless television promotion make this film good? No! It’s a pretty darn good film on its own. We have all been Ralphie (played by Peter Billingsley) hoping for that one Christmas present that will make our life complete. On the flip side of that we’ve also all had that one relative who gets us that one gift that we have to grin and bear while we have no interest in it. In the film’s case it is the pink bunny outfit! The over the top narration from the adult Ralphie is what really sells this film as every tiny little plot point is made into something grand by the perspective of the elder Ralphie reflecting on his youth. This film also made ‘leg lamps’ and ‘Red Rider BB Gun’s’ iconic. I think this film was just ahead of its time when it came out and it’s great that it finally got it’s due…but if TBS could just maybe cut back a bit; many of us would be better off and the movie would start to be funny to me again. I have literally seen it probably about a hundred times.